SUNRICE has posted consolidated revenue for the Group of $582.9 million for the six months ended 31 October 2018 (HY19) – a 7 per cent increase compared to the previous corresponding period ending 31 October 2017 (HY18) – while recording Net Profit after Tax (NPAT) of $13.9 million for the same period – a 42pc fall from the HY18 figure. “As advised at the AGM in September 2018, FY19 is anticipated to be a challenging year for the SunRice Group. 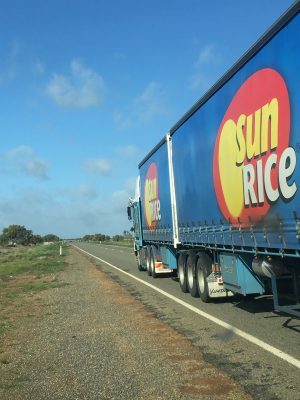 Prevailing global rice market trading conditions and exchange rate movements, which are both beyond SunRice’s control, impacted on the Group’s HY19 revenue and profitability,” SunRice chief executive officer, Rob Gordon, said. “SunRice’s 7pc revenue increase compared to HY18 was due to a combination of factors. International rice prices firmed during the period by around 30pc and exchange rate movements enhanced the value of Australian rice exports. “Despite stronger revenue, SunRice profitability was undermined by several factors. The firmer rice prices that benefited revenue also increased the cost of some of SunRice’s key internationally sourced export varieties. “In addition, profitability was negatively impacted by the falling value and lack of liquidity of the PNG Kina, as well as other generally unfavourable foreign exchange movements compared to HY18. “Pleasingly however, the Rice Food, CopRice and Riviana businesses all experienced profitability growth during the Half. CopRice performed particularly well, having benefited from the increasing demand for stockfeed with revenue increasing by 49pc. a rice mill in the Mekong Delta province of Dong Thap that will provide SunRice with a fully vertically integrated supply chain in Vietnam and a more stable supply of rice. Mr Gordon said SunRice would be listed on the Australian Stock Exchange (ASX) in early 2019, providing the opportunity to raise equity capital in the future to allow the business to pursue its 2022 Growth Strategy. “Our guidance for Net Profit after Tax for FY19 remains at between $30-35 million,” he said. Rice Pool revenue increased by 15pc compared to HY18. This positive result was driven by the geographical sales mix of Australian rice exports into markets such as Japan and the Middle East, which were sourced from the International Rice segment in HY18, and the expansion of the Koshihikari rice varietal and Long Grain sales into food service channels. Operationally, there were challenges during the period associated with lower whole grain yield impacting milling efficiencies. costs associated with the establishment of a vertically integrated supply chain in Vietnam; and increased provisions for doubtful debts in some markets. The outlook for international rice prices is anticipated to support improved profitability for the International Rice segment in the second half of FY19. Trukai delivered solid top-line performance during the Half, but the devaluing PNG Kina is increasing input costs and a continuing lack of liquidity in this currency impacted profitability, increased the value of the intercompany balance payable to SunRice and increased financing costs. During the Half, Trukai also benefited from a $1.3 million share of net profit in associate, which was primarily driven by the revaluation of investment property. While sales volumes and revenues marginally declined during HY19, NPBT increased by 144pc compared to HY18. Improved profitability during the Half was driven by positive performance by the rice flour and ‘mini-bites’ categories, as well as reduced advertising and trade spend. Riviana NPBT increased by 5pc compared to HY18. This performance was driven primarily by margin and market share growth across most product categories in the retail sector, including Riviana’s private label business, which continued to capture market share from other brands. Corporate segment offset this positive performance, which is expected to further benefit from the recent acquisition of the Roza’s Gourmet business in the second half of the year. CopRice continues to experience the positive turnaround that commenced in FY18, with NPBT increasing 145pc compared to HY18. The launch of new products focused on sheep nutrition, as well as seasonally dry conditions, have driven an expansion of stockfeed sales volumes, which has offset the rising cost of raw materials. a ‘one-off’ $1.75 million gain on the revaluation of property. These were offset by an increase in costs associated with the pending ASX listing and other strategic projects. Sunrice anticipates that NPAT for FY19 will be between $30-35 million. exchange rate movements and issues, including the continuation of recently observed improvement of PNG Kina liquidity. The estimated paddy price range for base grade medium grain (Reiziq) is $360-$400/tonne. While SunRice is confident of achieving the lower-end of this range, market factors and trends will need to continue in SunRice’s favour in order for the upper-end to be realised.